Wildlife ACT conducts intensive endangered species monitoring work in Zululand, South Africa. This requires us and student volunteers to go out into the reserve every day and find these animals using either VHF tracking equipment (which you will be given instruction on how to operate) or conventional spoor tracking techniques. We also develop photo and illustrated identikits of all the species we help monitor. Before you design a project based on our work in South Africa, it is best that you first understand the work which we do and within that the scope of data we have available for analysis and the environment within which you can collect additional data. From a student perspective the field of monitoring offers a bounty of opportunities for data collection – whether it be as simple as recording a location and noting the surrounding habitat – through to dung collection and DNA analyses. 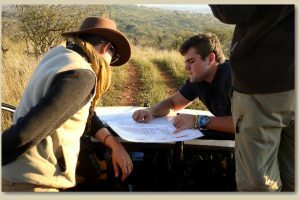 Students and wildlife researchers could ask for access to previous information collected before they arrived so as to enhance their data set and research projects. Time spent with Wildlife ACT can help ensure that meaningful wildlife conservation projects are developed.